I like the Flying A gas sign there on the left. There is still a Flying A sign on the building at SE Tacoma and Highway 99 on the south side of the building. Can you SEEgrams? Wow, is it big enough? Quite elegant for a parking garage. Anyone know it’s history? Jim if you Google search Corbett brothers auto storage garage you can read about it’s history on the national registry of historic places application. My screen resolution is not great. .99 cents per ehat? 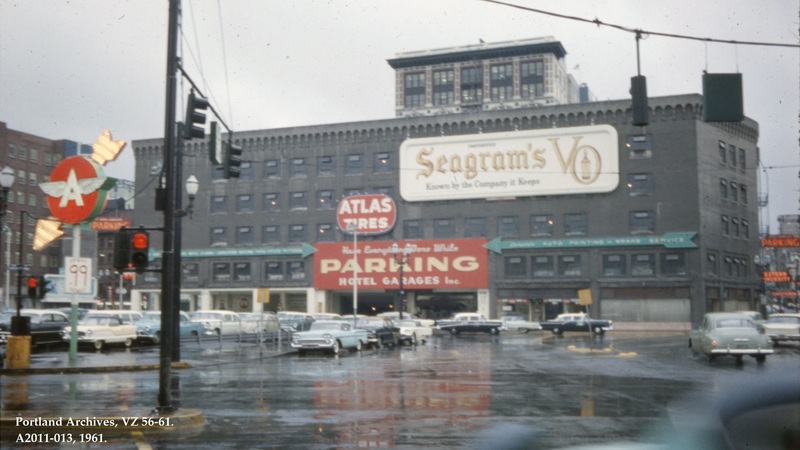 The color of the building back in 1961 was right in the swing with today’s popular colors of grey & black for Portland brick structures. Jaymalea: I think the “.99” sign is possibly advertising the price for a carton of cigarettes. I see the word “Brands” at the top; but can’t make out what’s written on the bottom. I see a Nash Metropolitan! I had one of those! A 1962, the last year they were made. I loved that car. Not trying to be a “Debbie Downer” but my opinion of the appropriateness of the building is not as positive as Jim and Susan’s. I think it looks like a Bastille. The cornice is a Romanesque revival style while the remainder of the building is 1920’s utilitarian. The storefront detailing has no clear style and was produced at the whim of the architects. I think it is a huge gray monolith guarding the north entrance to the downtown core. Not a very appealing gatehouse. I hope it has been seismically upgraded. Thanks Mike and Susan, now I want to go park on the top floor someday! 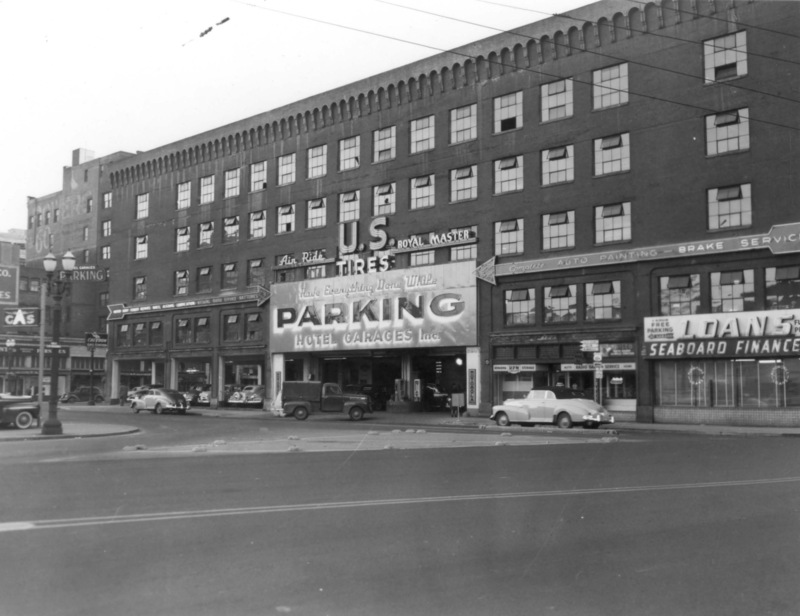 I wonder how many older Portland structures that currently park cars (SW Salmon @ Park, NW Davis @11th…) were either built for that use or conversions. There ought to be a book…. Vlad, I have to agree with you as to the parking garage’s esthetics. In those days it was a forbidding monster. I was surprised when I learned that it was designed by Doyle. It looks better in the current gray, and it would look even better in white and cream as described by Susan. Not sure what year, but they eventually removed the windows. Most likely for ventilation. Your looking South on Broadway from the North side of Burnside. Stunning to me that this view, from the intersection of two downtown arteries, can still be reproduced with nothing more than a chainsaw. Please don’t do that, of course, unless you’ve got grander plans for this underutilized lot. so nice not to see anay ugly modern skyscrapers in portland !! !